Bettye Krolick was an accomplished musician, was devoted to her family, had a life-long desire to help others and was driven by her inexhaustible sense of adventure. After her children left home, she combined her love of music and volunteerism to embarked on a journey as a music Braille transcriber, which eventually led to her becoming the President of the National Braille Association and the opportunity to travel the world and author the first International Braille Music Dictionary for the Library of Congress. Bettye Allerton Maxwell Krolick, of Fort Collins, Colorado, died from complications of Alzheimer’s Disease on August 5, 2011 at the age of 85. Bettye was born on August 1, 1926, to Earl Renshaw Maxwell and Dorothy Gertrude Tobey Maxwell. The family joke was the Bettye was born in a barn – Barnes Hospital in St. Louis, Missouri. As a young girl, Betty’s family moved to Glen Ellyn, Illinois, near Chicago. It was in Glen Ellyn, when Bettye was 5 years old, that she heard the next-door neighbor giving violin lessons. She was enthralled with the sound, begged her parents for a violin and soon began her musical career. After graduation from high school, Bettye attended Stephens College in Columbia, Missouri, her mother’s alma mater, and then went on to the Eastman School of Music in Rochester, New York, whereshe graduated in 1948. While she was attending Eastman, she met an attractive string bass player, Ed, who proposed to her after a rousing game of ping-pong. They were married in Missouri in 1948, and made beautiful music together ever since. Soon after their graduation and wedding, Ed and Bettye earned positions with the San Antonio Symphony. While waiting for the orchestra jobs in San Antonio to begin in the autumn, they found themselves driving through Grand Lake, Colorado. On a whim, Bettye took a job as a waitress, and Ed as a bell hop, at Grand Lake Lodge. Thus began their love affair with Colorado. They returned for camping vacations as often as possible over the years, and eventually moved to Fort Collins to retire. Realizing that a teaching position was more conducive to family life than an orchestra job, Betty and Ed moved to Champaign, Illinois, where Ed took a position with the University of Illinois. Bettye soon gave birth to their son, Kerry, who was closely followed by Kathy, Nancy, Phil and Kenny. Although Kerry had severe mental and physical limitations, and passed away at the age of 8, Bettye thrived as a mother and devoted her time and efforts to nurturing four healthy, happy and very lucky children. She also extended her family’s love to two sets of foster children over those years. Bettye and Ed also set a fine example of a truly happy marriage, and later in life took pride in the fact that each of their children enjoys happy, loving, long-term marriages of their own. As the children became older and more independent, Bettye enjoyed playing violin and viola with the Champaign-Urbana and Springfield symphony orchestras, and several other small area orchestras, all in Illinois, as well as the Memphis, Tennessee, Symphony. She was also very involved with the First United Methodist Church in Champaign. Around the age of 50, Bettye learned how to transcribe music into Braille and began doing volunteer work for the blind. Realizing there were limited resources available to blind music students, she wrote a helpful book called "How to Read Braille Music". She also taught many school music teachers how to help blind students become involved with the school band, orchestra or choir through Braille music. She soon discovered that the field of Braille music was not yet standardized throughout the world. She met with Braille music experts throughout the world and went on the write the first International Braille Music Dictionary for the Library of Congress. She served on the Braille Music Subcommittee for the World Blind Union. As technology evolved and the home computer became available in the 1980’s, Bettye, by that time in her 60s, kept up with all of the latest technological possibilities which allowed Braille transcribers to harness the power of the computer. In the 1990’s she became President of the National Braille Association. She continued to be actively involved in international music Braille transcription and teaching, including facilitating an international "chat room" on the internet (originating from Italy) about music Braille. Her devotion to Braille music over thirty years provided her the opportunity to travel widely throughout the world, including several European nations, Russia, China and New Zealand. During her career she enjoyed meeting many amazing people, both sighted and blind. In 2007, a brick was purchased in Betty’s name on the Wall of Tribute at the American Printing House for the Blind in Louisville, Kentucky. 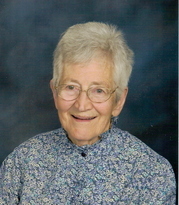 After Ed’s retirement from the University of Illinois in 1983, they moved to Fort Collins where Bettye played with the Fort Collins, Greeley and Cheyenne orchestras, continued her Braille work, volunteered at the Fort Collins Gardens on Spring Creek and was an active member of PEO and Christ United Methodist Church. They also enjoyed together traveling through Italy, England, Ireland, Norway, Spain, Poland and New Zealand. Bettye was pre-deceased by her son, Kerry Marc Krolick (1958), as well as her parents, Earl Renshaw Maxwell (1991) and Dorothy Gertrude Tobey Maxwell (2000). Bettye is survived by her husband, Edward John Krolick, of Fort Collins, Colorado, her children, Katherine Granas (Henry Granas), of Denver, Colorado, Nancy von Neumann (Michael von Neumann), of Atlanta, Georgia, Philip Krolick (Jeanee Reichert), of Corvallis, Oregon, and Kenneth Krolick (Jeanette Krolick), of Tolono, Illinois, her grandchildren, Lee Allerton Granas, of San Francisco, California, and David Moshe Granas, of St. Louis, Missouri, and her brother, Robert Edgar Maxwell, of Gunnison, Colorado. In lieu of flowers, the family suggests donations to the National Braille Association, 95 Allens Creek Road, Bldg. 1, Suite 202, Rochester, New York 14618, or to the Alzheimer’s Association of Northern Colorado, 415 Peterson St., Fort Collins, Colorado 80524. When Bettye was diagnosed with Alzheimer’s Disease in 2004, in her typical optimistic fashion, her motto became “I’m not going to focus on what I can’t do – I’m going to focus on what I can do.” Bettye did so much during her long life, and our world is a better place because she was here. To continue our discussion of teaching through duet and group performance let’s take a look at another musical tool for braille readers – that of the canon. A canon is defined as the most rigid form of musical imitation, requiring at least two parts following each other in succession. The traditional canon often sung by school children is, “Are you sleeping, brother John …”. These can be most enjoyable while learning to read braille piano music, and offer endless opportunities for an instructor to use for recreational playing experiences. Have each student learn his or her part well enough to play at a slow steady tempo, using the ideas presented in our Fall 2009 issue (Volume LI, No. 3). Encourage memorization of short excerpts before attempting to perform them with second or third parts. Try assembling two and four measure segments of the music with all parts, even though the entire piece may not be ready. This will significantly stimulate class interest while striving to “get it right,” and helps to combat repetition fatigue. A most helpful approach is to use the word rehearsal, rather than practice. Comparing the class with pop music or orchestral rehearsals necessary for live performance can help children to identify with favorite artists, and to better tolerate repetitive practice. Following is a little canon that you can try with two or more students, or even just one student and teacher. These and others are available in the series, “Introduction to the Piano for the Blind Student,” Graded Studies, Book 1 (www.dancingdots.com). Prerequisite: Be sure that you have taught the “D” five-finger position for each hand first. Come join the action with a subscription to the MENVI discussion list! All registered members are eligible to subscribe. That completes the journal. Please select from one of the following links to continue.